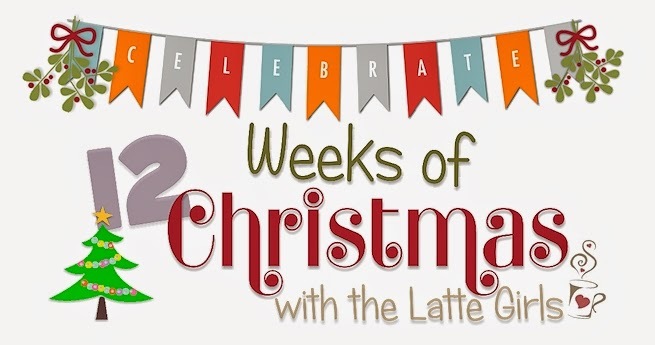 We are into Week 2 of our 12 Weeks of Christmas. Today we have the very talented Virginia Hampson showing us her amazing creation. Week one was a wonderful Star Gift Box Stack by Leonie Schroder. Who are the Latte Girls? I have used Basic Black A4 card stock, sheets of double sided patterned paper from our annual catalogue calledTypeset, the wonderful Holiday Home Polymer Stamp set, Very Vanilla card stock stamped using Memento Tuxedo Black ink pad and hand coloured the houses with Blendabilities. For the gold stars I've used Glimmer Paper and some of them have been 'suspended' by gluing to strips of Window Sheets. The Christmas trees are from the same Holiday Home stamp set, stamped in Mossy Meadow, the brown trees were double stamped in Baked Brown Sugar and Crumb Cake inks. I've also added some accents on the trees by dabbing on Versamark ink and sprinkling Iridescent Ice Embossing powder and heat setting with a heat gun. I even stamped in Crumb Cake ink on the envelope so it all matches. Other supplies and tools used were White and Iridescent Ice embossing powder for the snowy hills, Versamark ink pad to get the embossing powder to stick, Dimensionals and scrap card for layering on the trees and houses, Tombow Multipurpose liquid glue, paper snips and paper trimmer and the cute star punch from the Itty Bitty Accents Punch pack. This particular Card In A Box, though it folds down to fit into a C6 sized envelope, it's not a tall square one that has been popular online this year. This one opens to a more squat box so that you can create your own scene. The basics are the same as all Card In A Box instructions, just the dimensions of the brackets and where you cut and score are different. Purchase this bundle for $85.90 and get the Glimmer paper for free! If you want the instructions on how Virginia made the base, then email me and I will send you the pdf. Isn't this just gorgeous !!! Make sure you watch out for next weeks 12 Week's of Christmas because it is my turn to wow you with everything Christmas. Until then, happy stamping and thanks for dropping by.